In the mood to breathe in some delicious — and cooler — mountain air while taking in outrageous views? 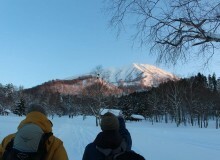 Our recent trip up Mount Gassan in Yamagata had something for everyone in our three-generation party. 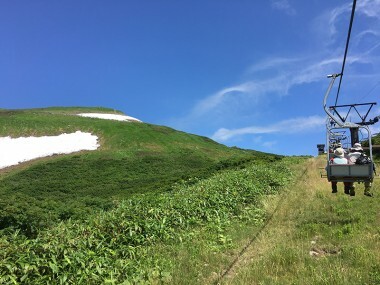 Gassan, which officially opens to non-skiers every year on July 1, is the highest peak of the three sacred mountains of Dewa. Begin your ascent at the ski lift, where an unobstructed access to the sky lends a magical character. In a world of traffic jams, crowded platforms and speedy bullet trains, the ride is a one of a kind chance to be suspended in air. Suspended, yet moving along a single silent rope with nothing but beauty in 365. The honking drivers and whirring engines fade to quiet. There’s not even the metallic clicking and screeching you would hear during the ascent on a roller coaster. So if you’re in Japan on national Mountain Day (August 11), whether you enjoy hiking or not, go ahead and treat yourself to a little magic. The view from the lift alone is enough to raise excitement levels and more than enough to satisfy those less inclined to climb on foot. For those who don’t mind a bit of a jaunt, head for Ubagatake (姥が岳), the first “peak,” to reach full panoramic potential. The easy to moderate climb takes 30 minutes and is well worth it. Looking back, we could see the lift and the rest station where we’d dismounted, now in miniature. Beyond it, the nearby river snaked through lesser peaks. We were enveloped by rolling velvety green, dots of yellow wildflowers and rock outcroppings providing the only contrast. Facing forward, the sea seemed an impossibility. Yet there it lay: not more layers of hills, but the edge of Japan itself. And above it all, the boundless blue. From Ubagatake, look northwest to see Mount Choukai in the distance, still patched with snow in summer. Descend slightly and continue on the well-maintained wooden plank trail that winds through the expanse of green toward the summit. 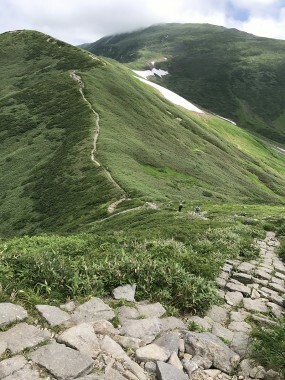 After 40 minutes, the incline steepens and gets rockier at Ushikubi (牛首). Here you can choose to loop back through a landscape seemingly akin to Irish pastures to return to the lift station. For a good workout, continue upward for roughly one more hour to reach the shrine at the summit, a pilgrim destination for ages. 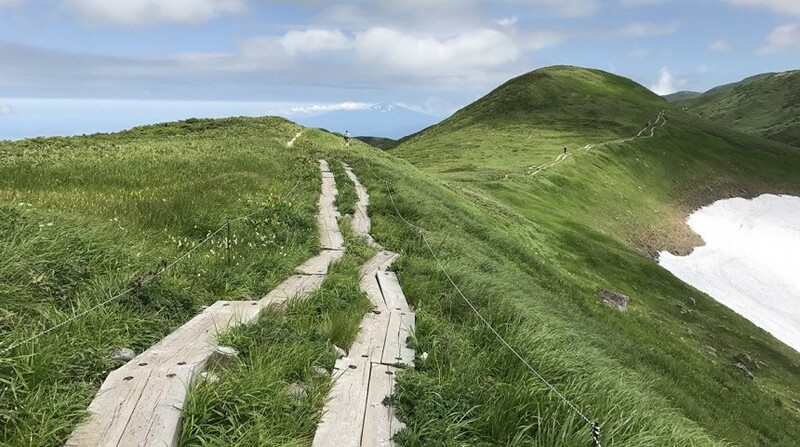 Along the way you will surely encounter more than one group of elderly die-hards outfitted with walking poles and light packs, a common sight on Japanese mountain trails. For anyone feeling temporarily fatigued by the ascent, the camaraderie offered by these youthful troops injects a physical and mental boost. With the encouraging call of “ganbatte!” echoing through the journey, the atmosphere of fun is infectious. Back at our lodge, we lazed the late afternoon hour away in the outdoor, wood-fired bathhouse. The sweet cedar scent of the baths was a perfect companion to the mountain views. While the kids played badminton on the open lawn, adults enjoyed a cold beer before the evening barbecue. Yamagata’s beloved daughter, singer songwriter Asakura Saya, sings about the expansive blue sky of her hometown in the refrain of her breakout hit, Tokyo. She moved to the metropolis at age twenty to chase her dream, but lamented the “narrow sky” she found there. Her traditional — and powerful — vibrato is fitting tribute to the uniqueness of Yamagata, notably the unbeatable openness. Take the Yamagata Shinkansen to Yamagata Station. Rent a car or take a bus to Nishikawa station (approximately one hour). Arrange with your ryokan or lodge for shuttle services from the bus station. Alternatively, fly to Oishi Yamagata Airport. Rent a car or take the daily shuttle buses to Nishikawa. Yumiharidaira Park, eight kilometers from the lift, has log cabin cottages and “auto tent” camping. The park itself has peaceful walking trails as well as playground and tennis facilities. Pole Pole, at the edge of Yumihaidaira Park, has cottages for 2-4 persons as well as hotel-style rooms. The family-run operation also offers outdoor and cultural tours. A cluster of ryokan in Shizu, five kilometers from the lift, boast natural salt baths surrounded by primary forest. Yatunami, the very clean and well-run ski lodge, just a 15-minute walk from the lift, is open year round. A mountain hut at Gassan’s summit offers dorm style lodging with dinner and breakfast included. If you’re camping out or staying at a lodge with kitchen facilities, stock up on supplies in Yamagata or Nishikawa. Most lodge or ryokan stays include breakfast and dinner; pack lunches can also be ordered. Lunch items are served at the ski lift building. Remember that convenience stores are not as common a site as they are in Japan’s cities, so stock up on your favorite snacks or pack your own lunch before hitting the trails. 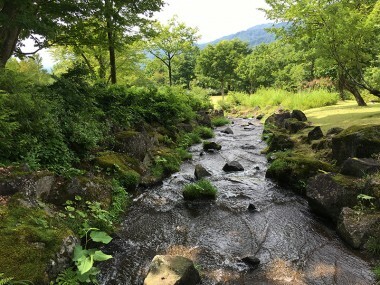 Michi no Eki in Nishikawa – If you’re driving, stop here to recharge before heading home. 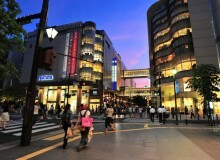 Shop for souvenirs and snacks, and fill up on standard fare road food (curry rice, ramen and soba). You can also find wild mountain grape juice, drunk by locals by the spoonful as a tonic to prevent ailments and ensure overall good health. For an entrance fee of just 300 Yen, enjoy the onsen and sauna next door. Kaerunoko located just 100 meters from Nishikawa Michi no Eki, offers excellent homemade soba noodles with duck meat. Yamagata boasts some of the best soba in all of Japan due to the low to zero percent of wheat used in the noodles.